2x Local Windows PC’s (virtual or physical) newly installed and patched. Latest HTRC client installed and fully sync with the block chain. The first thing we need to do is send our stake amount of 5,000 HTCR to a new address that will be our node address. It has to be exactly 5,000 coins not more, not less. Open the Debug window and select the “Console” tab. Type in <getaccountaddress Wallet1> where Wallet1 is the name you give your node. You should get a familiar looking coin address. We now need to send 5,000 HTCR to this new address. Close the debug window for now and navigate to the Send TAB. 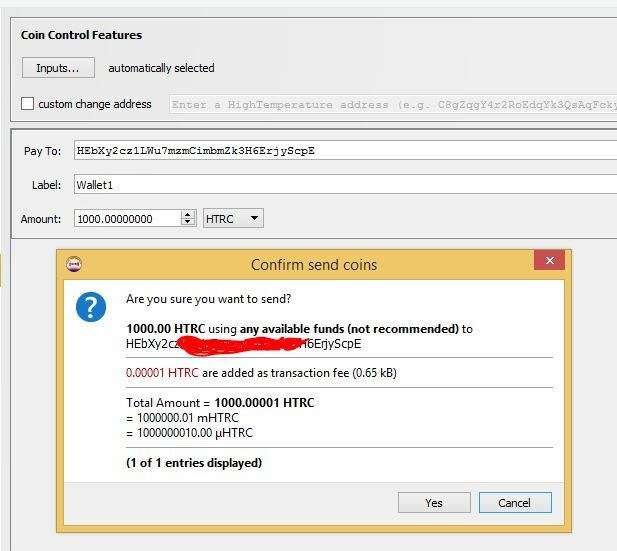 Send the HTRC coin to the new address you have just created by pasting in the new address in the “pay to” field. The label field should auto populate with the name you gave the address confirming the address you are about to send to is correct. You will see a pop up message saying that you have sent 5,000 HTCR to Yourself, wow that was scary!!! Back on the dash board you should see the same balance minus a small transaction fee, check the Transaction tab and wait for at least 15 confirmations before continuing. I normaly like to wait for 20, were in no rush. Back to the Console, you should know where it is by now. Type <masternode genkey> you will get a much longer string compared to the wallet address you created. This is your Master Node private Key. Save this in the text file on your desktop. Also on the Console type <masternode outputs> You should now get another long string. This is your “VALID TRANSACTION HASH” (the long number) followed by your “TRANSACTION INDEX” (the single number). Add this to your notes document for later. Now that the configuration files are setup we can reboot both Nodes and confirm they both auto start. If not check the settings under options tab.